A delicious North Indian unleavened bread. Suitable for vegetarians. 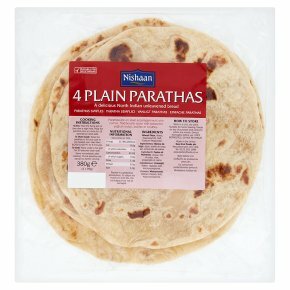 Parathas are an ideal accompaniment with curries. Traditionally eaten with seasoned yoghurt (raita), pickles or chutney. Serve immediately after cooking. Check parathas are piping hot before serving. Wrap the parathas in foil and cook in pre-heated oven Gas Mark 6(200°C/400°F) for 8 minutes. Place under a hot grill for 30 seconds each side. Heat the frying pan or tava over a high heat. Heat the parathas one at a time for 15 seconds on each side.